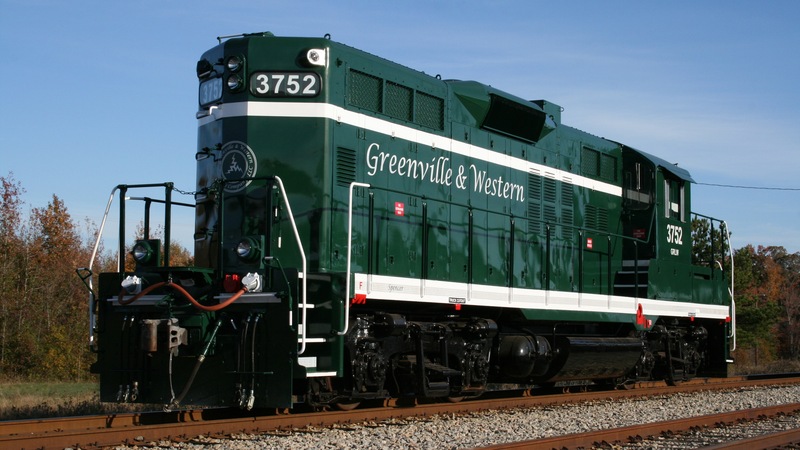 Greenville & Western Railway Company, LLC (GRLW), a wholly-owned subsidiary of Western Carolina Railway Service Corporation, owns and operates 12.74 miles of rail line in Anderson County, South Carolina. The road’s roots can be traced back to the original 1910 charter of the Greenville, Spartanburg & Anderson Railway (GS&A). The line was part of a section of the GS&A that was constructed between Greenwood and Greenville between 191 0 and 1912 and the company, together with its affiliate Piedmont Traction Company, were collectively recognized by the public as Piedmont & Northern Lines. Following the 1911 charter of the Piedmont and Northern Railway Company (P&N), both companies were absorbed into the P&N in 1914 and such was the line's identity through 1969. Purchased by Seaboard Coast Line Railroad in that same year, the line, as the result of successive mergers that led to the formation of CSX Transportation (CSXT), remained under CSXT ownership and operation for over 36 years, ending October 20, 2006. Effective October 21, 2006, GRLW assumed ownership and operation of the line which serves the Belton, Cheddar, Williamston and Pelzer communities. Once a candidate for abandonment, GRLW continues to upgrade the infrastructure of and add capacity to its line to further aid in the ongoing development of adjacent parcels, in order to attract new businesses to locate along the line and bring additional new job opportunities to the citizens of Anderson County. GRLW interchanges with both CSXT at Pelzer and the Pickens Railway (PKHP) at Belton. GRLW also has interchange access to Norfolk Southern (NS) at Anderson via its PKHP connection at Belton. GRLW currently offers seven-day service and customizable switching services to its customers and boasts the only heavy machinery rail transload facility in the state: Big Creek Machinery Distribution Hub, located in Williamston. 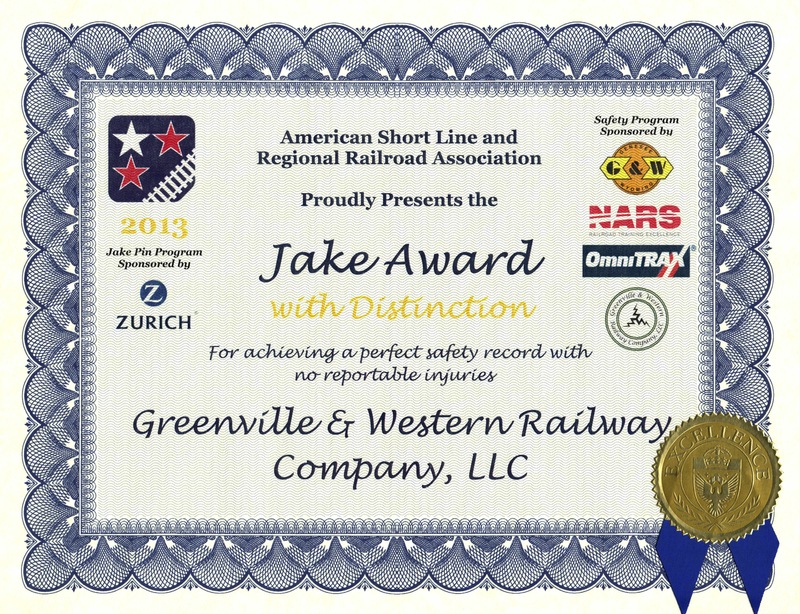 GRLW is a member of the South Carolina Association of Railroads (SCAR), a member of the American Short Line and Regional Railroad Association (ASLRRA), recipient of the ASLRRA's annual Jake Award with Distinction for achieving a Frequency/Severity Index of 0.00 for eleven of the past twelve years (2007-2014, 2016-2018), as well as being a Titanium-Level Official Sponsor of the ASLRRA Jake Award Safety Program. In addition, GRLW is the recipient of CSXT's 2009 Short Line Business Development Award for achieving the highest interline percentage growth (of all connecting CSXT short lines) and placed in the top three for CSXT's 2010 Short Line Business Development Award competition in both the interline percentage increase and interline incremental volume (carload) increase categories. GRLW is the recipient of the ASLRRA's 2010 and 2015 Marketing Awards and was named Railway Age's 2010 Short Line of the Year. GRLW also received CSXT's prestigious 2012 Regional Development Partnershipping Award for being instrumental to the success of a regional development project. The company's principal goal is to provide safe, reliable and efficient rail services and facilities to its patrons. For more information on available sites (SC Department of Commerce registered sites below) or to discuss how Greenville & Western Railway can serve your business and shipping needs, contact our business office at 864-334-5374. Tariffs can be downloaded here. 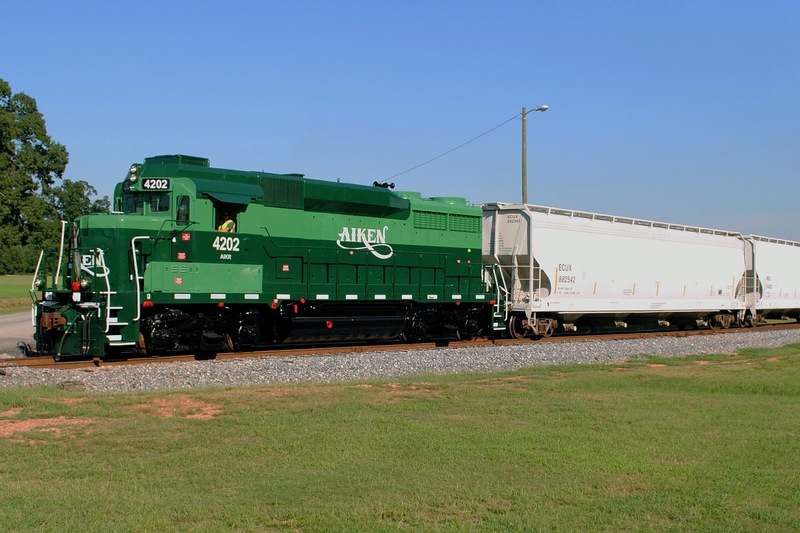 Aiken Railway Company, LLC (AIKR), a wholly-owned subsidiary of Western Carolina Railway Service Corporation, leases and operates 18.90 miles of rail line in Aiken County, South Carolina. AIKR's 12.45-mile line between Warrenville and Oakwood owes its heritage to South Carolina's first and oldest railroad, the South Carolina Canal and Rail Road Company. The line was chartered by the South Carolina General Assembly in 1827, with the route being completed through Aiken in 1833. The 6.45-mile line extending between Aiken and North Aiken was completed by the Edgefield, Trenton & Aiken Railroad in 1879. The combination of these remnants today allows AIKR to sustain the more than 180-year record of continuous rail service in Aiken County, serving Oakwood, Montmorenci, Aiken, and Warrenville communities while offering satellite access to the North Augusta, SC and Augusta, GA markets. AIKR has begun to upgrade the infrastructure of and add capacity to its line to further aid in the ongoing development of adjacent parcels, in order to attract new businesses to locate along the line and brin g additional new job opportunities to the citizens of Aiken County. AIKR interchanges with Norfolk Southern (NS) at Warrenville, SC and currently offers five-day service to its online customers. 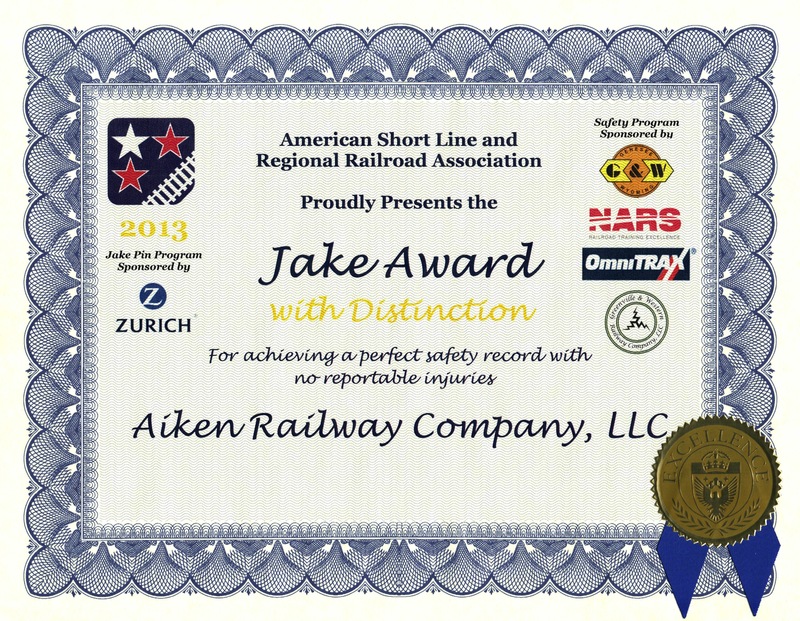 AIKR is a member of the South Carolina Association of Railroads (SCAR), a member of the American Short Line and Regional Railroad Association (ASLRRA), and recipient of the ASLRRA's annual Jake Award with Distinction for achieving a Frequency/Severity Index of 0.00 for the past six consecutive years (2013-2018). AIKR is the recipient of the Norfolk Southern 2013 General Manager's Award - Piedmont Division for a seamless startup transition and exceeding customer expectations while improving service levels in the first 6 months of operation. AIKR is also a member of the Economic Development Partnership of South Carolina (EDPSC). 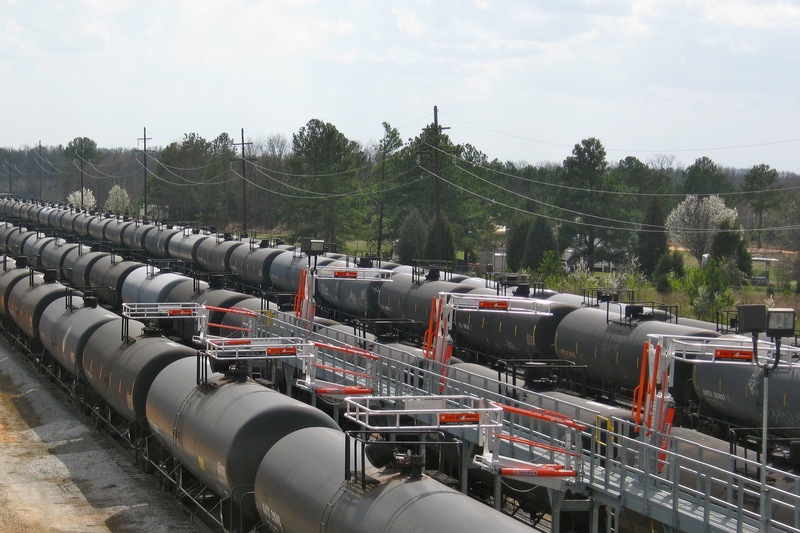 For more information on available sites or to discuss how Aiken Railway can serve your business and shipping needs, contact our business office at 864-334-5374.